Sue Sifton's equestrian art is represented through many different mediums including bronze, porcelain, plastic and artist resin. 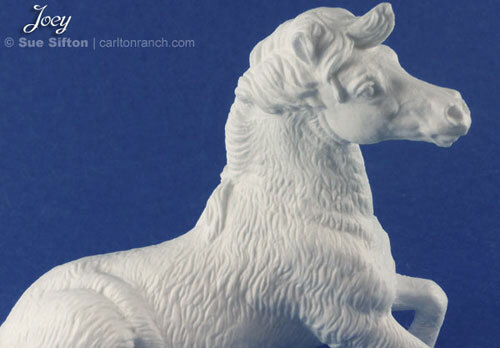 She has created some of the most popular models for original finish model horse collectors, and is now offering limited edition artist resin models from her studio. Joey is a traditional size trail pony. He is a limited edition in hollow cast artist resin. Joey is inspired by a riding school pony. He is a ham, very much his own self, wary of big people, but quite fond of his small charges that he has trained to bring carrots. He looks quite sleek in the summer. The kids work so hard to get him looking clean and handsome in the winter, but he can fix that. View Joey's webpage for more details! Happy Trails is a traditional size trail horse. She is a limited edition in hollow cast artist resin. 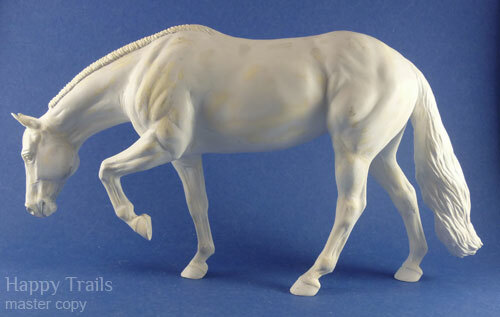 Happy Trails has a very detailed, short banded mane and forelock with a long flowing tail. View Happy Trails' webpage for more details!